Hobart could be a great city to ride a bicycle. It’s compact and not too steep apart from some streets and suburbs which could be accessed easily by electric bikes. We have two well-used separated cycleways in the Intercity Cycleway and Rivulet Path, but both end on the edge of the city. Riders then have to battle heavy traffic on the road or try to use crowded footpaths, where it is allowed. This understandably turns a lot of people off riding in the city. The Bicycle Council has come up with a plan for a network of separated cycleways to access the city centre that would connect with our existing off-road paths. The plan is the minimum network the Bicycle Council thinks would be useful for riders and could be expanded over time. It’s essentially a loop around the city centre with extra access from the north to the waterfront via a low-speed Elizabeth Street connection that also has some protected cycleway. 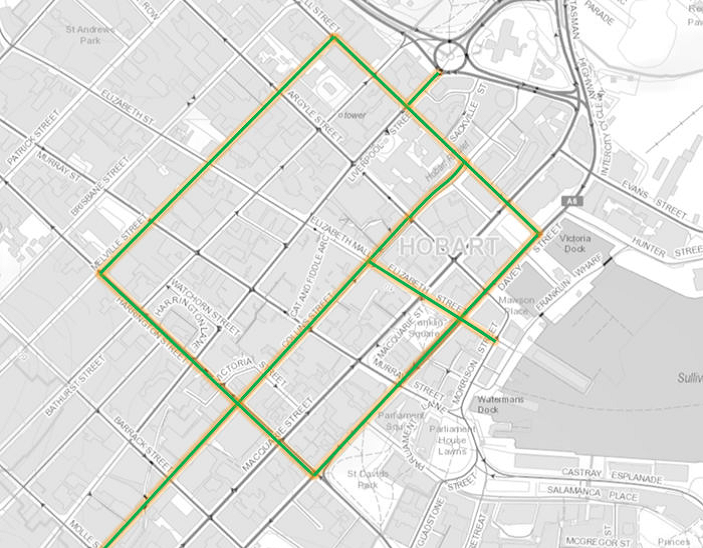 The bi-directional loop takes in Davey, Collins, Harrington, Campbell and Melville streets. This means people could travel into the city starting from South Hobart and Claremont and stay mostly separated from traffic as they head to work, university, school or the shops. Building separated cycleways is relatively easy – you put physical separation between riders and moving traffic such as a kerb, planter boxes, parked cars or bollards – but requires a reimagining of how we use our road space. We dedicate a lot of road space to storing private property (parked cars) when roads should ideally be for moving people. The Bicycle Council plan tries to minimise the loss of parking by choosing bi-directional cycleways. In some cases parking on only one side of a road needs to be removed to create the space for a cycleway. On other streets it may also involve narrowing traffic lanes. This allows loading zones, disability parking and short-duration parking bays to continue on the cycleway streets. The Hobart City Council could also choose to offset the lost parking bays by converting the early-bird parking at Hobart Central carpark to short-term parks, and creating greater capacity on some side streets with parallel parking. Losing some on-street parking to make way for cycleways can improve traffic flows as there aren’t people circling around looking for a park or reverse parking. Other cities that have converted parking or traffic lanes to cycleways have found that it helps businesses along those streets by bringing more people past their shopfronts to be regular customers. The Bicycle Council has put forward this network plan to start people talking about what we could do in Hobart. We have a regional arterial bike plan that the state government and Greater Hobart councils agreed to ten years ago but it doesn’t specify which routes should be separated. Some of the routes have been completed with painted bike lanes, but these tend to cater to already confident riders which only represent up to 7% of the population. If we’re going to encourage the 60% of the population who are interested in riding but concerned about traffic we need to provide cycleways that make riding an easy, comfortable choice. With the University’s announcement that it is moving its campus into the city centre, we need agreement by state and local governments to a cycling network plan that will make bicycle riding a genuine transport option. We need a plan for Hobart that has separated cycleways at its core and provides a network of direct, connected routes to take people where they need to go for education, work and services.